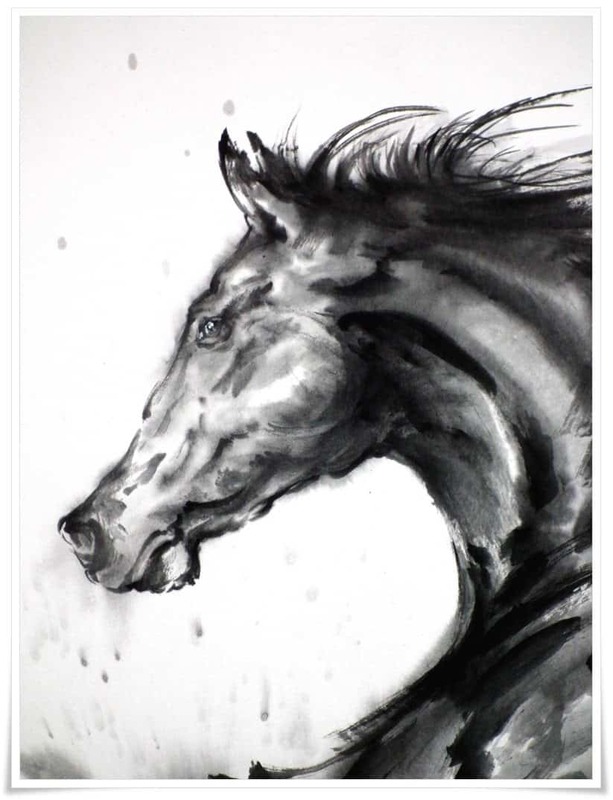 The art of ink painting (墨絵, すみえ, sumi-e), being a discipline native to Far Eastern cultures (mainly China and Japan), is rather exotic in Poland, my home country, especially for a person not acquainted with Asian cultures. Fortunately, the nature of art is boundless and has allowed me to venture deep into its alluring realm. Figure 1. Western and Eastern dragons differ greatly. Asian dragons are powerful but benevolent, wise and bearers of good luck. 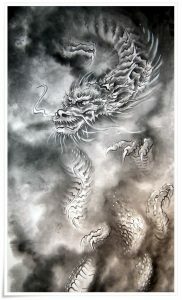 My intention in this painting was to conceal a dragon in clouds in order to emphasise its mythical nature. I wanted to leave much to the viewer’s imagination. This painting reveals a dragon hidden in clouds but ready to tear them to shreds and appear in its full glory. Figure 2. Detail of painting shown in Figure 1. Copyright (c) 2012 Beyond Calligraphy & Mariusz Szmerdt. All rights reserved. My fascination with Japan and its culture began with martial arts. The spirit and mind-set required for training in martial arts corresponds to that of the art of ink painting and calligraphy. Following the path of budou (武道, ぶどう, budō, i.e. “martial arts”), I embraced the philosophy of Buddhism and Zen. 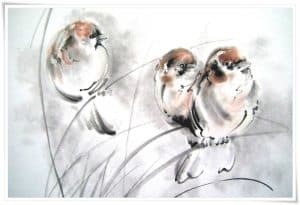 This led me to discover Japanese painting which charmed me with its profound depth and aesthetic sophistication expressed through simplicity of form. To that medium my heart dedicated itself forever, and today my life is defined by traces of ink. Figure 3. Not quite pleased with the final outcome of my first painting of a dragon, I tried once more a few days later. The powerful aura of the second dragon reminds us of the border between our world and the realm of ancient myths, reminding us to respect the unknown and untamed forces of nature. Half-wrapped in a curtains of clouds, the dragon reveals himself only to a chosen few who perceive that which surrounds on a different level. Figure 4. Detail of painting shown in Figure 3. I grew up surrounded by artists. Despite a busy life, my mother always found the time to set up her easel and brushes and to paint. Beckoned by my artistic instincts, my attention drawn magnetically, I offered my own soul to the world of colours and light. Spending many years studying various painting techniques beginning with oil, water colours, through charcoal, pencil, and even stained glass-work, my first contact with ink was made through the art of tattoo, practiced professionally in my studio for 13 years. 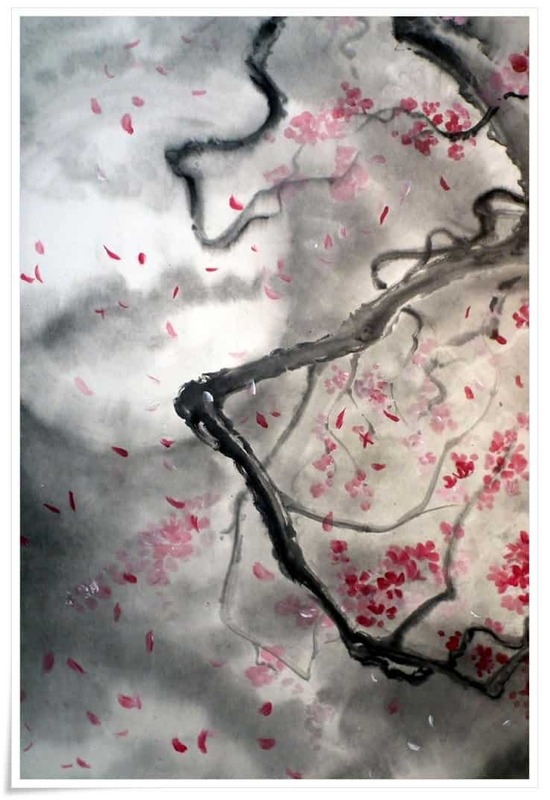 However, when I discovered the art of East Asian ink painting, I realised that it was precisely what I was searching for subconsciously, allowing me to express myself artistically without any reservations or restraints. When I paint with ink, I feel as if my art is perfectly attuned to my mind and spirit. 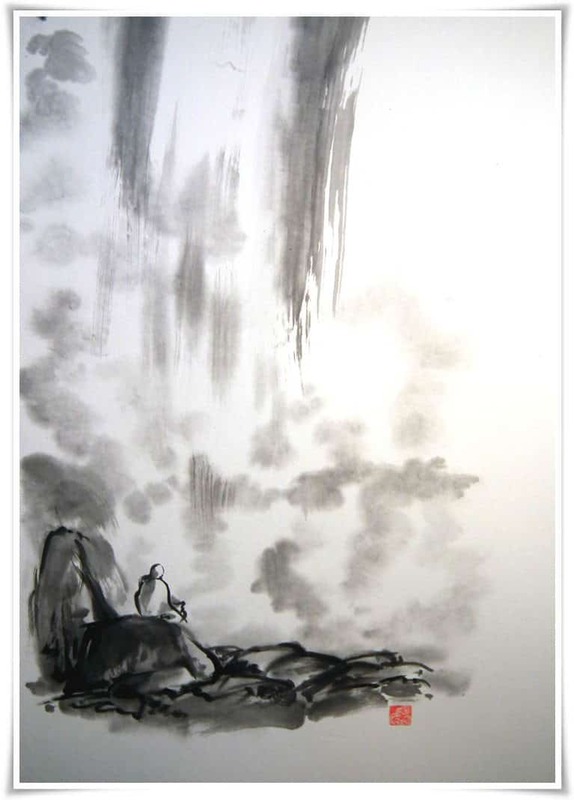 The ethereal nature and stunning simplicity of the art of ink painting, as well as its rich spirituality, had me decide that this is the path I shall follow. 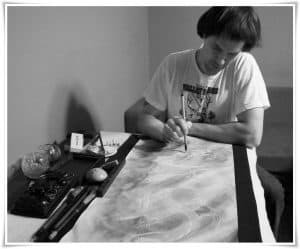 It is not only a form of art in which my artistic potential is fully realized, it is also closely related to the philosophy of Buddhism, still present and very important in my life. Figure 5. Meditating near a waterfall. Throughout my studies of Buddhism, I learned that one does not have to necessarily seek solitude to meditate. Distracting surroundings may in fact be helpful in reaching a state of detachment or spiritual concentration. In the painting shown, despite its fragility and insignificant size, the static figure of the monk sitting on the boulders faces the massive waterfall and its immense power. The rapid water is an allegory for the modern world and its unstoppable rush. My intention here is to show that a true master of self can mediate anywhere and anytime, regardless of the circumstances. Figure 6. Detail of the painting shown in Figure 5. In Ink painting is found the essence of the Universe, free of unnecessary brush movements or corrections that destroy energy flow (行気, ぎょうき, gyōki). A magic-like form of painting, it introduces the viewer to a whole new world of surreal and symbolic dreams which stimulate the imagination. The purpose of ink painting is to sense the delicate nature and impermanence of morning dew on spring grass, to feel the cold of snow and the warmth of the reflecting rays of the sun, to hear the sounds of birds crying in the crystal air on a winter day or to comprehend the precise dynamics of a warrior’s movements and the powers that define them, these are all ink painting’s essence. Figure 7. A cherry tree twig soaked in the moonlight, my attempt at depicting the vulnerable and mythical aura of nature. 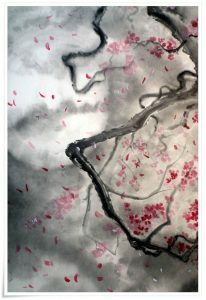 The petals of cherry blossoms flutter, carried by a gentle evening breeze and remind us of the impermanence of things. Figure 8. Detail of the painting shown in Figure 7. I have never had a true master to guide me through the maze of styles and schools of ink painting. Unfortunately, here in Poland, it is very unlikely that I will find one. My paintings are defined by my personal views and canons and mirror a very individual and raw approach to this art. If my art allows the viewer to detach from their surrounding reality even for a split second and flow on the creek of its uplifting energy, as artist, I am hugely rewarded and blessed. The sheer purpose of art is to evoke hidden sensations, to move and to touch, and to bring people together through untainted emotions. 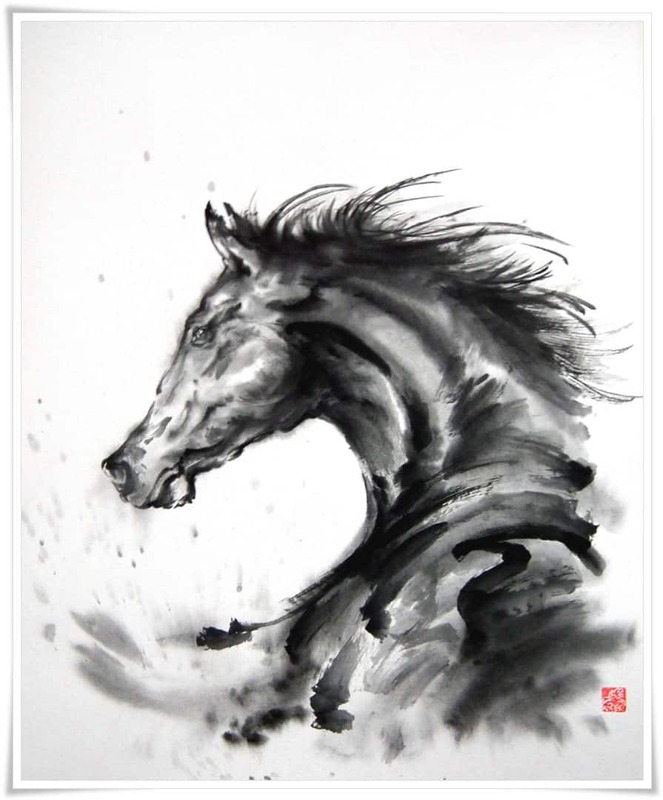 Ink painting is a wonderful medium, and, like music, it makes us forget our worldly differences, stereotypes, language barriers, religions, and all of the social ties which divide us like an abyssal rift. Figure 9. The horse has a symbolic meaning in Polish culture and particularly in the history of the military. Many great victories were achieved by the cavalry. For example, in the battle of Kircholm (1605 A.D.), Polish Hussars (heavy cavalry) were victorious against a Swedish army three times stronger. For over 200 years, the Hussars were feared and touted as the most powerful military formation. In 1939, the last time in history, Polish Uhlans (light cavalry) drew their sabers against the German invasion. The painting of the horse is a tribute not only to the bravery of those men but most importantly to this magnificent animal. Figure 10. Detail of the painting shown in Figure 9. I like comparing ink painting to rock climbing about which I am also passionate. Both are based upon moves that cannot be corrected, as there is no room for error. Both are ways of meditation. Ink painting is a world of dots, splashes, blurs and even colours on a white background, creating a bridge for our mind to cross over to the other side of human perception. When the body is one with the mind, each move mirrors the state of the artist’s soul. Both require a calm mind and peaceful atmosphere, self-control, but at the same time untamed expressiveness and energetic moves. All of these states of mind coexist harmoniously and are present in each painting or rock climbing session. To discover them one must contemplate a painting or a mountain and understand all of the elements and relationships between the mind/body and the subject. Figure 11. 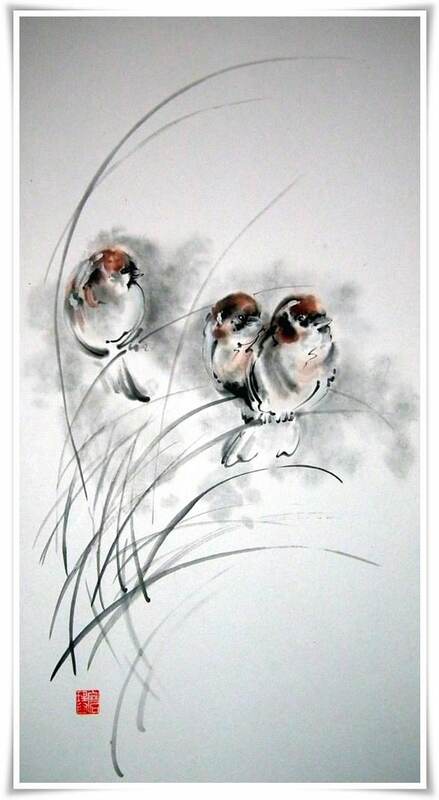 Painting depicting a group of sparrows resting briefly, swinging on the long grass, leaves swaying in the wind. In order to emphasise the brevity of the scene, I used a very simple technique of fast and dynamic brush strokes and irregular dots. Figure 12. Detail of the painting shown in figure 11. Ink painting is a path of life. One works continuously on developing one’s inner self, new possibilities and undiscovered talents. It is an infinite path, all consuming and never ending. Member of “International Chinese Calligraphy & Ink Painting Art Society” (ICCPS), Tokyo, Japan. Alpinist, painter (who is trying to make the art of ink painting popular in Poland), amateur photographer who enjoys outdoor activities. Loves open space and nature. Buddhist who prefers to stay as far away from politics and suits as is humanly possible. Retired martial artist (aikido and karate). Enthusiast of white weaponry with a particular weakness towards Japanese swords. Loves history, antiques, old castles, and haiku, though feels that writing poetry is not his forte. Eternally wandering, his favourite quote is “To each his own Everest”. 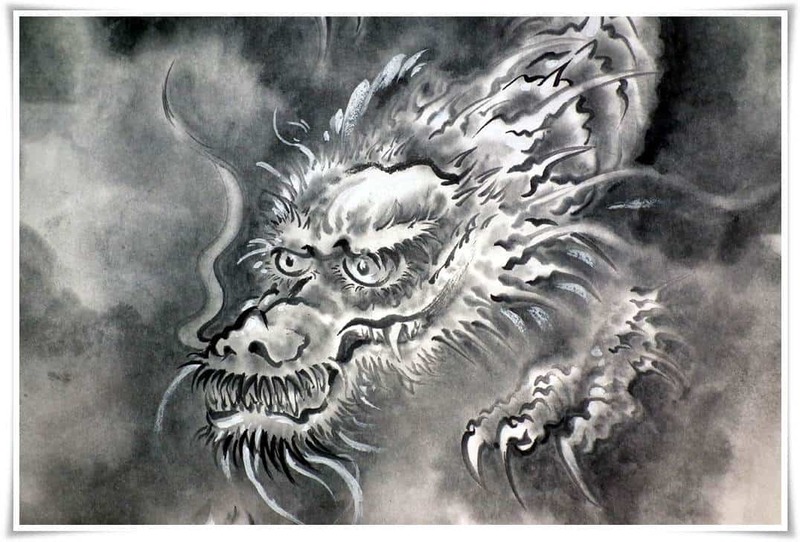 Continuously in search of a Master who would lead him along the path of ink painting. Inspired by his wife, son, and the wonders of Mother Earth. Hello Ryū-I enjoyed this article as it depicts the inner nature of the interdependence of the painter’s mind as a way of life, much like a poet. Is this a friend of yours from Poland? Who wrote the article, you are him? Whoever, it is an excellent article offering much inspiration for artist and calligraphers alike. The Polsih text, art and pictures are all work of Mariusz Szmerdt, an artist from Poland. Mine is the translation of his article in Polish. I hope this clears things up. I am Yamabushi priest Kûban Jakkôin of Kyoto Shôgoin temple following Shugendo (mountain buddhism) path since 30 years, living inside my own hermitage in apls of France. Today by Ponte Ryûri ‘s post on FB, I could see part of your fantastic works. I saw in very few painting ( of temples) in Japan an energy as youre! Your waterfall, horse, birds, cherryblossom under full moon light, Nobori Ryû are coming from the “Gate of letter A” (Ajimon). I agree, Jackie. The expressiveness and power of black and white reality is pure magic indeed! Thank you so much for introducing Mariusz! It was truly my plesure, Gabi. Personally, I think he is an autstanding ink painter, and it is a privilege to host his art on our humble website. Thank you for such a nice comments. It is a great pleasure to have an oportunity to expose paintings on Beyond-Calligraphy. All your notices and comments are very helpful in my daily work. I hope I will have an occasions to show more paintings. Wishing the best to all of you. Special thanks to Ponte Ryuurui, Rona Conti and everyone who is involved in this project.